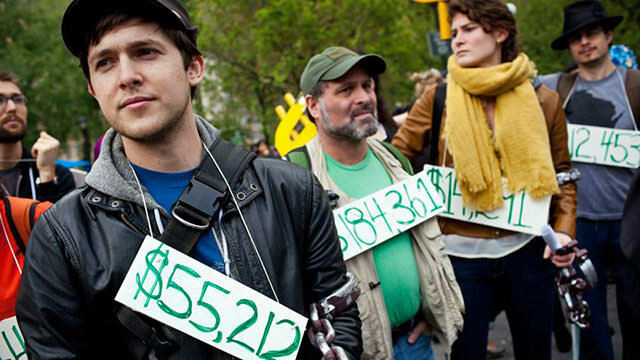 Student loan debt is crushing the American middle class. In fact, the total amount of debt from student loans in the United States is now greater than credit card debt AND auto loan debt – and it’s growing, quickly. A recent study by Mother Jones concluded that for the Millennial generation alone, the cost of going to college has risen 12 times compared to what the previous generation paid for school. And with the days of the Great Recession far from over, as the United States and other countries continue to suffer from the effects of the 2007-2008 financial crisis (not to mention the large number of foreign immigrants with U.S. jobs), the amount of jobs available to today’s college graduates are slim to none. With poor job prospects and a massive amount of debt, American 18-34 year olds are often without health insurance, a decent salary, a decent credit score, let alone any way to be approved for a housing mortgage. In this environment, millions have inadvertently defaulted on their student loan payments, creating massive problems for their future as they face bankruptcy and a ruined credit score. In the United States, defaulting on your student loans is one of the worst things you can do to yourself. Not only does it destroy your credit score, but the IRS could garnish your wages or tax refunds for decades in order to pay back your loans, among dozens of other possible nightmares. Unfortunately, the vast majority of Americans do not seem to be aware of the very simple and easy way to STOP their student loan payments. And even though the predatory nature of student loans means that declaring bankruptcy does not usually absolve you from having to pay off your student loans in full, there is still an easy way to stop your loan payments during times of financial hardship. And whether you are working part-time at Costco, living with your parents, or even teaching English abroad, there’s a strong chance it will apply to you. And the real kicker? It’s a PDF form that only takes 5 minutes to complete. Dear government, I have no f*cking money. Nor do I have a high-paying job. Please stop or greatly reduce my monthly student loan payments, until I’m rich. Sincerely, Poor College Graduate Living In A Country Controlled By Corrupt Politicians And Wall Street Bankers. It doesn’t matter who your student loan servicer is, because they are all forced to abide by federal guidelines that allow borrowers to stop payments at any time under the right conditions. And while some private servicers (i.e. Sallie Mae) will try to confuse the sh*t out of you about those conditions, its actually quite simple. Anytime your monthly salary (i.e. part-time job) is low enough, you simply attach a copy of your salary contract or recent pay stub, send in the below PDF form, and wait a few days for approval. In most cases, the IBR (Income-Based Repayment) is the simplest option, and you’ll usually qualify for $0 in monthly payments if your salary is somewhere around $20,000 or less. The newer “Pay As You Earn” option has been strongly endorsed by President Obama and usually sets your monthly loan payments at about 10% of your monthly income. Note: If you have difficulty understanding this form, simply download the PDF and then call your loan servicer on the phone and tell them you require help filling it out.